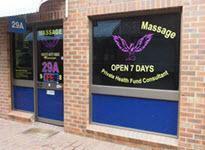 We have north shore massage clinics spread from Mosman to North Sydney and up the Pacific Highway through Crows Nest, Chatswood and as far as Gordon. If you are looking for Hornsby, we've included that in the Northern Districts section. Most of these popular massage centres have been with us for a long time and despite a few changes of management, their essence of reliable Asian style relaxation and therapy remain. Click on the tiles for details, and the phone numbers to direct dial.